Did you know that milk isn't healthy at all and that the myth around milk as health food is a product of marketing tricks of the dairy industry? The dairy industry is one of the most powerful industries of the world, right next to weapon, meat and tobacco industries. 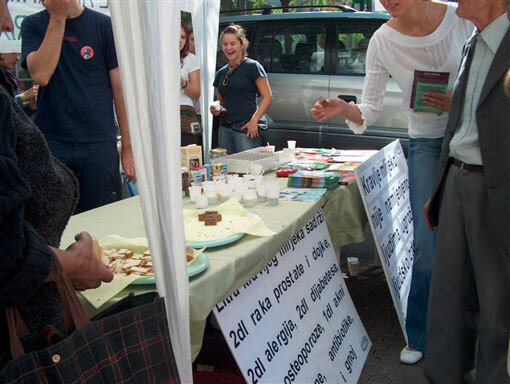 With the purpose of informing public on cruelty involved in the dairy industry and hazardous effect of diary products on man's health, Animal Friends will, on Saturday September 18, 2004, in front of Dubrovnik Hotel in Gajeva ulica in Zagreb, hold an info stall and hand out info materials about diary industry and set info panels with photos. 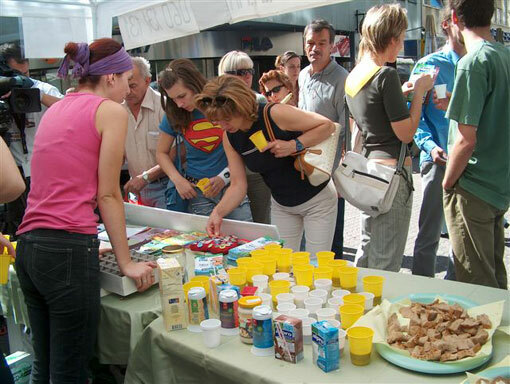 At 12 noon there will be a great tasting of soy, oat and rice milk, non-dairy creams, puddings, yoghurts, cheeses and "cheese" spreads, and delicious vegan cakes. Milk is supposed to feed only the young of own species. It is natural to no species to drink milk in the adult age, and even less natural to drink milk of the other species, so the man is the only one who drinks milk in the adult age and, furthermore, milk of the other species. Consumption of animal milk can damage human health in many ways: lactose (milk sugar) intolerance; arteriosclerosis; cardiovascular diseases; greater risk of breast, prostate and colon cancer; greater possibility of having some serious neural illnesses such as amyotrophic lateral sclerosis; allergic reactions on milk proteins; infectious diseases caused by bacteria (Salmonella, Yersinia, Campylobacter, Listeria), viruses and microorganisms; resistance to antibiotics as a result of common exposure to antibiotics in milk; bad influence of hormones, pesticides and other substances like blood and pus; possible connection of several kinds of leukemia with cow leukemia virus. Children can have allergies, a kind of anemia resulting with lower intelligence, early start of arteriosclerosis, juvenile diabetes (type I), acne, rheumatoid arthritis, caries and infectious diseases. Diary products are bad for your health and are connected with many illnesses caused by inappropriate modern diet of children and adults. Furthermore, the dairy industry is cruel murderer of animals and causes great environmental pollution: most cows are artificially inseminated; cows are milked several times a day up to ten months per year, even during pregnancy; instead of giving three liters of milk a day for their calves, they give 30 liters; calves are taken away from their mothers shortly after birth and after four months killed for veal; cow's udder can weight 100 pounds; cows are fed with protein concentrates in order to boost milk production; 25% of all cows suffer from infections like mastitis; natural lifespan of cow is around 20 years, but overexploited, exhausted and sick cows are usually killed at the age of five; cow's waste is main pollutant of water: cows produce around 200 liters of methane, one of the major causes of global warming. Even though our body doesn't need milk, we don't have to stop using dairy-like products. There are many kinds of plant based milk on the market, such as soy, rice or oat milk, almond milk, non-dairy cream, cheeses, puddings and yoghurts. Those products are cheaper to produce, don't damage environment, don't cause animal suffering and their taste is far better than the one of animal secretion. With this action Animal Friends wants to point out that every individual can make a choice and decide will he, or will he not, continue to support the myth around dairy products and that way damage own health, support animal slaughter, pollute environment and exploit natural resources.